Can I retro fit a stove? 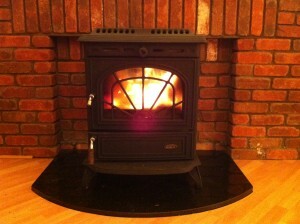 In most homes a stove can be fitted into the existing fireplace. The main things that a stove will require is a chimney suitable for the new unit. It is often recommended that the chimney for the stove is lined with a narrower flue pipe than would be standard for an open fire. The reason for this is the heat rising will be lower in temperature than in the open fire. This is caused by the higher efficiency of closed stove units. It also means the smoke and exhaust air leaving the boiler will have a better ability to escape from the top of the chimney without back drafts as can be the case on wider chimneys. It is best to ask the stove supplier if this is the case for the unit you are buying.The photo below shows a stove in action where an open fire had been lit the previous week. Will the stove heat my radiators and hot water cylinder? If you buy a boiler stove suitable for the heating demands of your house, then yes it can. A properly installed boiler stove can be set up with a new dual coil cylinder in order to heat the hot water for the house and it can also be fully connected to the radiator loop in the house too. What is a dual coil cylinder? Most homes with gas or oil heating will have a single coil cylinder to heat the water when the heating is on. 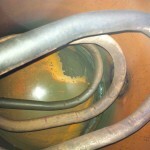 This is an image of the single coil in a cylinder after many years in use. 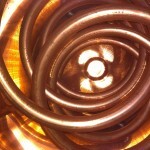 This is an image of inside a new dual coil cylinder. You can see the two coils interlocking down through the unit. When a stove is fitted in tandem with a gas or oil heating system then a dual coil cylinder is required. Your existing immersion rod system should be possible to move over from the old one to the new one but if you are unsure, ask the plumber installing the system. Triple coil? – was two not enough? If you have a third method of heating the water you may require a more specific cylinder. e.g. a solar panel triple coil cylinder or a heat pump triple coil cylinder. It is best to do your homework on cylinders most suitable to pair with any existing renewable energy set-up. It would also be a huge advantage to look into suitable cylinder installations if such a system was going to be of interest down the road. Why are boiler stoves becoming so popular? For many people the move to either renewable energy or passive house living is the issue of paying for oil or gas. These are both internationally traded commodities and have very volatile prices with slumps rare and price spikes common. We have very little control over our supply of these commodities and to have the ability to reduce our dependance is important to many, simply because it may save money in the long term on rising fuel costs. For others, a ready supply of fuel may be available to them at a keen rate. 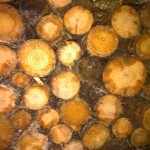 Or they might own forestry or farm land with trees lining hedge rows. It makes sense to take advantage of this if at all possible.